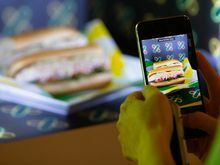 The Subway Fresh Fit® menu has 8 delicious 6-inch sandwiches with 400 calories or less. Fresh Fit™ subs on 9-Grain wheat bread are low in saturated fat, and have 24 grams of whole grains and two servings of veggies. If you’re watching your calorie intake, then you have some important (and nutritious) decisions to make! Which of these Fresh Fit™ subs will you order? 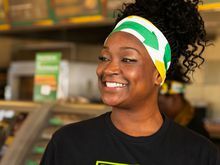 Subway Fresh Fit® subs refer to 6" subs prepared on 9-grain wheat bread with tomatoes, onions, green peppers, cucumbers, lettuce, and spinach with up to one Fresh Fit™ sauce. Subway Fresh Fit® subs are prepared in front of you and are not a diet program. 2000 calories a day is used for general nutrition advice, but calorie needs vary. Each 6-inch has two servings of vegetables. 1 serving=1/2 cup raw vegetables or 1 cup leafy vegetables. At 280 calories, this tasty sandwich is the lowest-calorie meat-containing sub on the Fresh Fit™ menu and delivers 18 grams of protein. Lanette Kovachi, MS, RDN, corporate dietitian for Subway, says it's a great option for someone who is watching calories extra-closely. Try it with mustard! A 6-inch Black Forest Ham sandwich has 290 calories and 5 grams of fiber. You’ll also get 18 grams of protein. If you’re looking to cut carbs, this sub — like all the Fresh Fit™ subs — can be made into a salad that contains five servings (2.5 cups) of veggies. 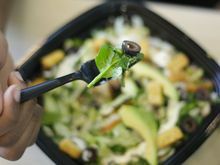 Each salad has five servings of vegetables. 1 serving=1/2 cup raw vegetables or 1 cup leafy vegetables. 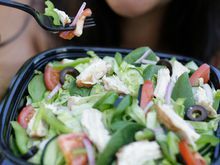 Vegetable servings refer to salads prepared to standard recipe with lettuce, spinach, tomatoes, green peppers, onions, cucumbers, and olives. 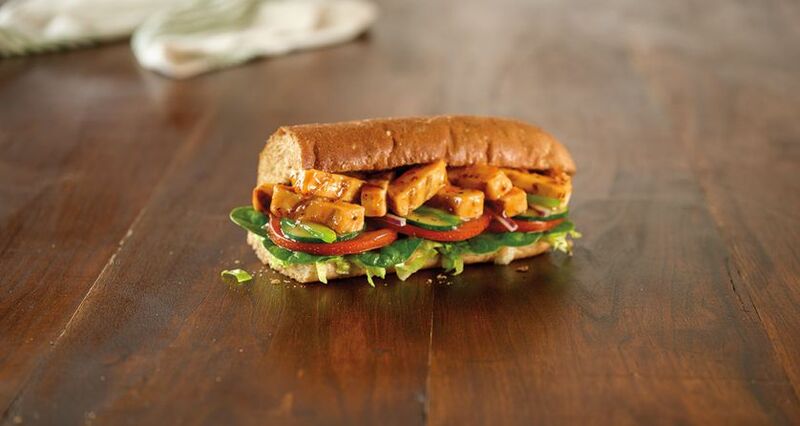 Our delicious Rotisserie-Style Chicken sub packs 29 grams of protein and weighs in at 350 calories. The tender, hand-pulled chicken is made with chicken raised without antibiotics. Plus, it's free of artificial preservatives and colors from artificial sources. Kovachi adds that the Rotisserie-Style Chicken sub is one of the lowest-sodium Fresh Fit™ subs. 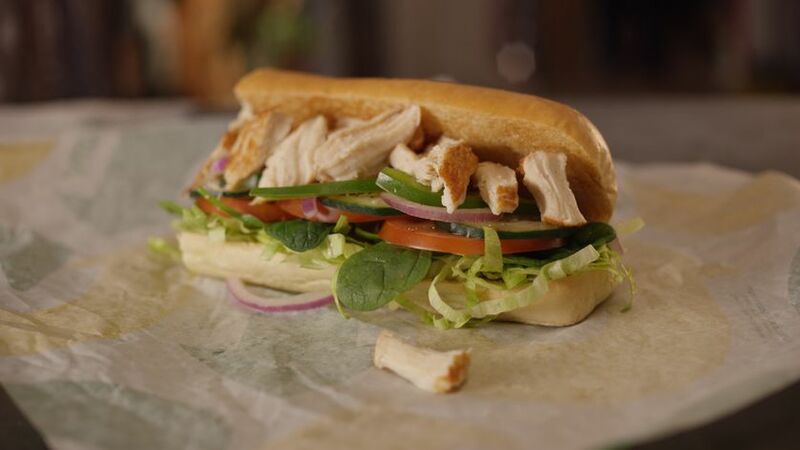 A juicy sandwich piled high with fresh veggies, the Oven Roasted Chicken sub will help you stay within your daily calorie needs with 320 calories and 23 grams of protein. 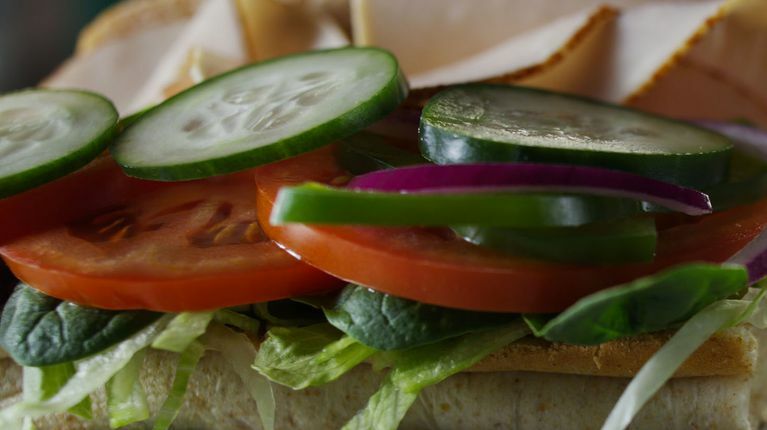 Kovachi adds that all Fresh Fit™ subs contain important nutrients like iron and vitamins A and C.
Talk about flavor! The Sweet Onion Chicken Teriyaki sub is stuffed with teriyaki-glazed chicken strips and topped with our delicious sweet onion sauce. Loaded with flavor and nutrition, this hearty sandwich weighs in at a sensible 370 calories. If you’re hungry, the Fresh Fit™ menu has a yummy Roast Beef sub that delivers on taste and nutrition. Piled high with lean roast beef, this 320-calorie sub contains 25 grams of protein. It’s low in saturated fat, too, which is the case with all the Fresh Fit™ sandwiches. It’s crispy, it’s crunchy, and it’s delicious. The 230-calorie Veggie Delite® sandwich is full of flavor and loaded with color. 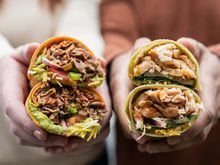 A great way to get more plant-based foods on the go. 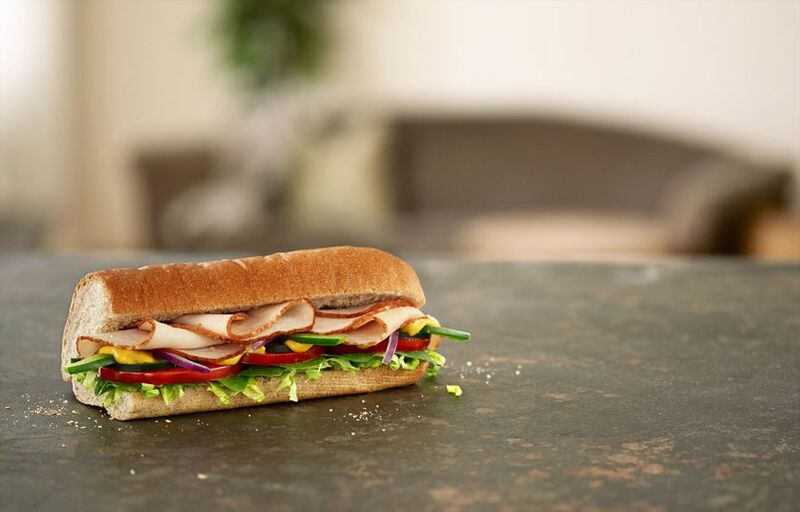 The Subway Club® is a flavorful sandwich featuring tender sliced turkey breast, lean roast beef, and tasty Black Forest ham. With 23 grams of protein and 310 calories, it'll satisfy your hunger or fuel a workout.